I'm now getting tomatoes a little faster than we eat them. Same with squash though did give away a few pounds. 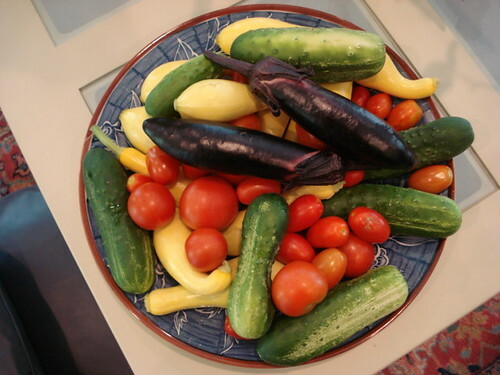 Cucumbers are trickling in, but staying ahead of our two cucumber per day requirement. Garlic are drying, with first batch cleaned and ready for storage. This is my 'Xian' harvest from one bulb's worth of cloves planted. Will keep about ten cloves for replanting and will eat the rest. We have 12 different varieties with anywhere from 8 to 12 or so bulbs each. Looks good Alex, I could go for any of that fresh produce right about now. Still awhile to go here yet, some radishes might be ready toward the middle of june. Won't see tomatoes until july sometime, peppers on the other hand I will see very shortly, there are little peppers popping up all over the plants. Do you use any season extending techniques? Maybe to some extent, like starting them indoors way ahead of time for example? Building a few cold frames and things like that. I could use any tips this is the first year I have really got very involved in gardening. and of course we are in the upper 50's again, in JUNE...that I really hate. I'm glad its only for 4 to 5 days. Any tips Alex would be great, cause I'm about ready to move . If I lived in such a cool short season area as you, would consider building some plastic covered panels to make clear plastic covered frames to cover early tomatoes planted in the ground, perhaps a month before the last frost. Single bulb lamps could be placed underneath on cold nights and would keep the plants from freezing or suffering cold damage. The clear covers would help heat the soil up and keep the plants happy while you wait on the weather to settle. I bet with just a little effort you could get your first tomatoes a month earlier than usual. Also, they make heating cables that use very little electricity and will keep the ground area around 60-70 degrees. Your cold frames should help you get very early salads greens and radishes. It is hard to get good advice from someone living down in this climate however, where lows rarely drop below the twenties, and daytime highs rarely drop below the 40's. A typical winter day here has a low in the 30's and the highs in the upper 50's or lower 60's. Perhaps some of your regional neighbors will chime in and give their favorite season extenders. Thanks Alex those are some good pointers. Next year I will be looking into some of those things; heating the ground would work great, do you know where I can get some of those cables? It would be amazing if I could get everthing in toward the end of April or atleast the start of May rather then the middle or end. The last frost date on some sites posted June 4th so I wasn't sure when to start planting. However the last frost we had probably was the first couple weeks in may. Sorry I guess I kind of hijacked your topic/thread. I'll post some pictures of my first harvest come the middle June. The cables are more expensive than I thought. Did a quick search but are likely many suppliers on line. Also there are discount greenhouse companies that sell clear plastic sheeting at a decent price. Or you could just use the 3.5 mil 10 foot by 25 foot plastic sheeting from Walmart. Your veg sure does look very good and healthy Alex. Just goes to show if you make the effort the rewards do follow. Looking awesome! We've had Snow Peas over the last month. They just keep producing. Our improved bush beans are also doing very well. I haven't taken any photos from after harvest, but I do have some before being picked. Planted pumpkins early to make pumpkins seeds and to can them for later in the year and to perfect pumpkin bread! Very nice, I especially like the looks of those zebra tomatoes. Can't believe your pumkin is already so large. The heat has already gotten our sweet peas but they were quite tasty for the three or four weeks of harvest. Thanks. We've had a good start hope it continues. The pumpkin photo was taken on June 2nd. It's double in size since then. This is my first time growing pumpkins - WOW do they take over! Right now we have 11 pumpkins. I am in the Northern, CA (bay area) and the heat hasn't started yet. It's been around 75 degrees. Bay area explains it. At first was thinking Gulf coastal area, as to how the pumkin had gotten so large. Then had a problem with the sweet peas which should be long dead in the Gulf States. Bet you have a really long season with salad greens and other cool weather crops. Well,I have nothing compared to you guys but i picked something today and here it is. 1 odd shaped cuke-still tasted like its supposed to. My platter is staying full of produce. Nothing is coming in heavily but is coming in enough to stay ahead of our most needs. Picked the first to egg plant fruit today. Squash have slowed to a trickle but the next bloom is setting fruit and will pick back up in a few days. Doubt that we run out before then. 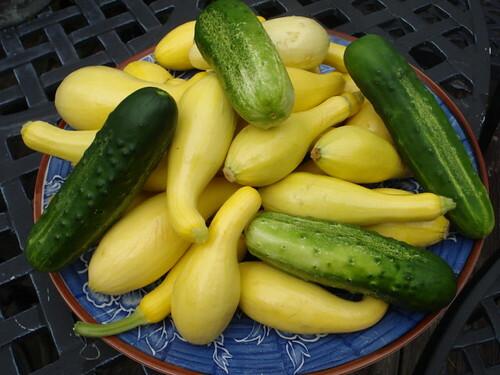 Cucumbers continue to stay ahead of our two per day consumption. Tomatoes are picking up. 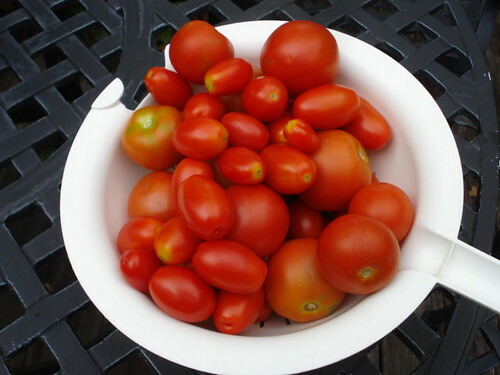 New tomatoes have gone to the platter while those in the collander are being eaten a few per day. Will have to start giving tomatoes away before long. 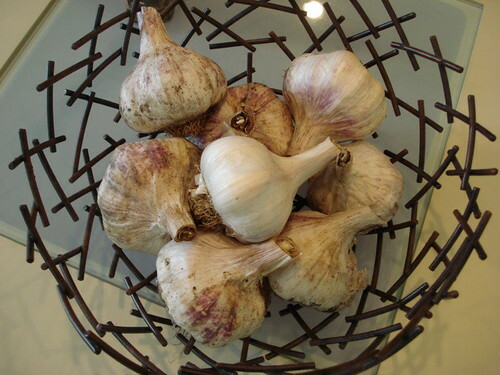 These are three of our garlic varieties. Have been trimming, cleaning and getting them ready for storage. Two bulbs have gone to the kitchen already. I have nine more types of garlic to dry, clean, and store. A few are still in the garden, but most are drying now and almost ready to trim and clean. This is our first light harvest of green beans. They will really pick up in a few days. But for now, this is a nice mess for dinner. Harvested a few new potatoes to go in with them. Last edited by hendi_alex on Tue Jun 09, 2009 9:03 pm, edited 1 time in total.